Bill and Betty Wilson, while they were together, authored 3 very well put together and informative books on western bottles. The first of these came to collectors in 1968 under the title of SPIRITS BOTTLES OF THE OLD WEST. 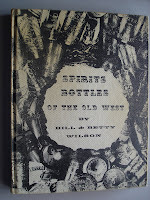 Numerous books and pamphlets had been published prior to Wilson's book, but SPIRITS BOTTLES took collectors to a new place. Not only was it a large book, with hundreds of examples listed and photographed, the bottles were also noted to be found in different colors and degrees of crudeness. Bottles were given a numeric weight so they could be compared with each other as to desirability. Wilson stated it perfectly in his book when he said "the one thing that creates value in a bottle is demand. Several factors may influence demand; rarity, color, crudeness, and popularity." In his book it was easy to see the older, more crudely made glob top fifths and flasks were quite different in appearance to the newer, tooled top style of the 1890's -1915. During this time period another book was being put together that really brought together as a group, collectors of the older glob top whiskies. John L. Thomas' book A CHOICE LISTING OF THE MOST DESIRED OLDER WHISKEY BOTTLES has a long title, but a narrow list of bottles. Thomas, with the help of pioneer collectors of these older fifths, put together a listing of 144 of the most desired western fifths. 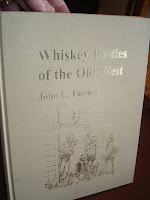 Thomas' book immediately became the bible for collectors of these early whiskies. Not only did he have a listing of the all the known early whiskeys, but he went into some detail on each bottle as to distributor, history of the company, how many examples were known, and where they have been found. I have a copy of his first spiral bound publication, possibly 1968. He published another updated version in 1969, under the same title, but including a listing of 47 of the older flasks. 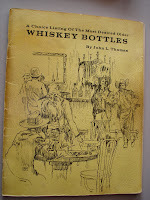 In 1977, Thomas revised his earlier work under the title of WHISKEY BOTTLES OF THE OLD WEST. The fifth section of this publication had grown to 177 bottles and the flask section to 64 examples. Not all of these were glob tops however, as this book contained a number of tooled top "picture" whiskies that had become popular with collectors. The flask section also has a number bottles that are known only with a tooled top. Maybe that is why Thomas eliminated the words Choice and Most Desired from the new title. --- Smile, I'm Joking!!! Kind of! Thomas' book remained the ultimate work on these older whiskies until 2002, when his work was updated and revised with the help of Ken Schwartz, Bill Ham and Richard Siri. Again, 177 fifths and 64 flasks. They kept the numbering system the same as Thomas' 1977 book to avoid confusion. Histories and bottle populations were updated. Nice color pictures were added and some very interesting research on bottles and distributors was included. As in the earlier Thomas books, a pricing guide or value guide was included for each bottle. When a book is published, everyone wants a pricing guide included. I'm sure it is a necessity. The bad thing is that the prices are almost immediately out of date. One of the uses of this blog is to present new information on these early glob whiskies, including pricing. I will track auction sales and private sales as best I can and report findings on a timely basis. Collectors can report what they see or hear about, as well a listing something they may want to sell. In all references to the early glob fifth and flasks I will be using the 2002 revised WHISKEY BOTTLES OF THE OLD WEST. The numbering system of this book will be used in the description to help avoid confusion. Example, J.H. CUTTER non crown, J.H.CUTTER full face, J.H.CUTTER oldest cutter, Oldest Hotaling, are all collector slang for the same bottle. My reference to this bottle will be J.H.CUTTER , HOTALING (T-49) or MILLER'S EXTRA OLD BOURBON large circle flask would be MILLER'S large (TF-19). It will be easy enough to follow along with the posts and entries I'm sure, but the book is the base line or standard work for collecting these old whiskies. Any information we can add to it will just add to your enjoyment of collecting. 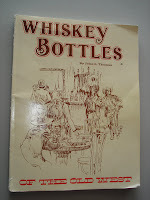 I have to mention one other very influential whiskey bottle dealer, and author. Bob Barnett served the collecting community very well for many years. He was a regular at all the western bottle shows and his regular listing of whiskey bottles for sale was sent out to hundreds of collectors throughout the country. Many of the desirable early whiskies are now in the hands of collectors in the Midwest and the Eastern states due to Bob and his mail order sales lists. His integrity and honesty made it possible for many new collectors to enjoy these early western bottles. Bob didn't specialize in just the early whiskies, but he provided whiskey bottles to collectors of all levels. Beginning collector or advanced collector could always count on finding something from one of Bob's lists or from his sales table. 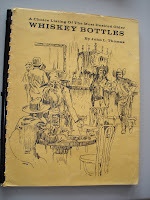 Bob published a listing of known whiskey fifths and flasks that included many small town or local bottles that had not been listed in print before. His work was revised 3 times and grew to be quite a complete listing or encyclopedia of whiskey bottles. His popular book is used by many collectors and dealers. good reading ,the 3-d gets everyone.